Commercial fishing should be banned in 30% of UK waters to save threatened species, an influential report says. 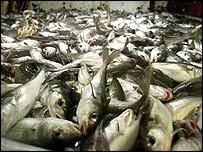 The Royal Commission on Environmental Pollution said the capacity of the UK fishing fleet should be cut "to an environmentally sustainable level". RCEP chairman Sir Tom Blundell told the BBC that the industry's future depended on such measures. But fisheries minister Ben Bradshaw said steps already taken had first to be allowed to have an impact. The report - Turning The Tide, Addressing The Impact Of Fisheries On The Marine Environment - says the sea should be treated in the same way as endangered land habitats. It said: "Currently, the marine environment is regulated on the basis of a presumption in favour of fishing... we recommend that the presumption should be reversed." The report warned that doing "too little, too late" would leave many sectors of the industry without a future. It recommended establishing a network of marine protected areas within five years, with the closure to commercial fishing of 30% of the country's exclusive economic zone - an area which goes out to 200 nautical miles from the shore around Britain. These protected areas could benefit the entire marine ecosystem, from spawning fish to deep-living organisms and the seabed itself, the RCEP said. Similar reserves established on Georges Bank, off the north-east coast of North America, have seen species recoveries, with the density of scallops increasing up to 14-fold within five years. While less than 0.5% of the world's oceans are protected, some countries have gone much further, with New Zealand and South Africa aiming to designate 10-20% of their waters as reserves. The RCEP also said the UK should ensure the capacity of EU fleets fishing in its waters are also reduced. Sir Tom said that without such measures, "many of the fish populations will just collapse". He added: "We have almost all of the industrially fished populations down to between 15 and 20% throughout the world. This is a catastrophe." The report urged the government to review the funding available to promote economic diversification in areas dependent on fishing. But Hamish Morrison, chief executive of the Scottish Fisherman's Federation, said the recommendations were already out of date. "We have a white fish fleet that has been cut in half, and the vessels that are left are fishing half-time," he said. Mr Bradshaw told the BBC that the fight to preserve marine life was the "second biggest environmental challenge the world faces after climate change". But he said it would be premature to implement the measures recommended by the RCEP. "We need to give more time for the radical measures that we have already taken to have an impact," he said. The report focused on the impact of fishing in the north-east Atlantic. It looked especially at the fisheries regulated by the European Union's Common Fisheries Policy and at the waters around the UK. The running costs of reserves to protect the North and Irish Seas would be £9-15m annually, it said, compared with about £35m a year to run the national parks in England and Wales. It said a global reserve system covering 30% of the oceans would cost £6.5-7.5bn a year, less than the £8-16bn spent in subsidies to commercial fisheries. The RCEP also said some of the effects of current fishing practices were ruinous: a recently-introduced net with a mouth the size of 50 football pitches, for example, and bottom-trawlers which plough furrows up to 6m wide and 0.15m deep for many km across the seabed. It cited a report by the International Council for the Exploration of the Seas which says the proportion of north-east Atlantic fish stocks within safe biological limits fell from 26% to 16% between 1996 and 2001. Would you eat this fish?